Yes, this is a metal bat. In fact, it’s actually the CAT7 disguised as a wood bat. With the Posey28 Pro Metal, Marucci aims to disrupt the sometimes repetitive graphics found on metal bats today. In our opinion, they did a pretty good job. As you can tell from the picture, the Posey28 features the classic “half-dipped” look that is common on wood bats. The entire handle is black and the barrel is natural maple colored. 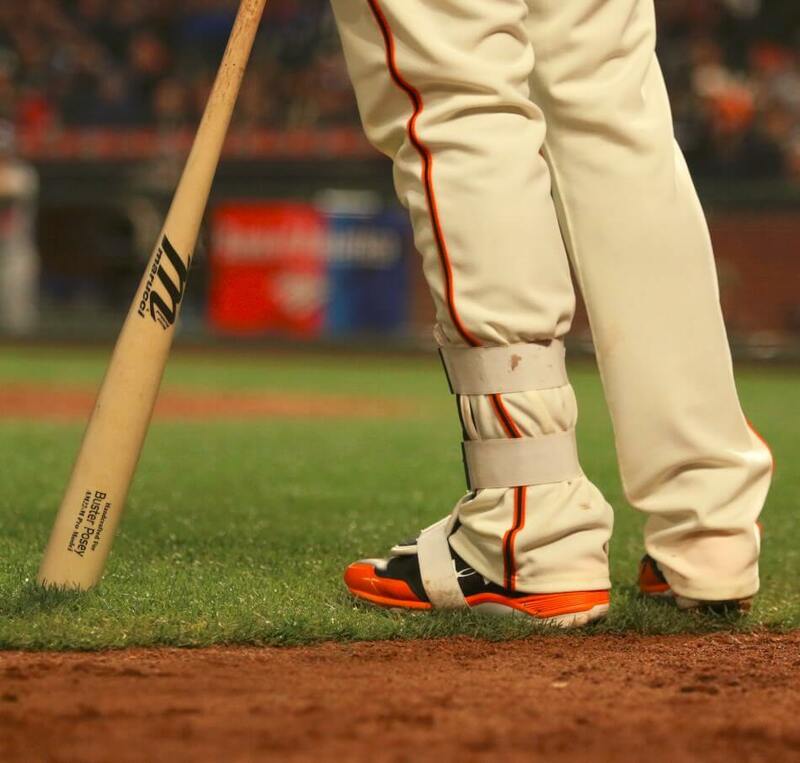 Marucci says the Posey28 is designed to look like Buster Posey’s game model bat. It’s interesting they went with a black handle, because most of the time Buster chooses to swing an all natural model. Regardless, Marucci did a great job of mimicking a maple bat, right down to including the grain of the wood. Towards the endcap, the paint turns to a burnt brown. This mimics a feature that Marucci puts on a lot of their wood bats with natural colored barrels. When looking at it from afar, the only way to tell this isn’t a wood bat is to see the BBCOR certification and sizing information that runs up the middle of the barrel. The handle and grip are both black. The paint here is shiny and looks much more like a metal handle than wood. The Posey28 knob is one of the most unique parts of this bat. Marucci calls it the AV2 (Anti Vibration) Knob, and it was first introduced on the CAT 5. The anti-vibration technology inside the knob makes it a little chunkier than most, but it’s really comfortable and does a great job of killing vibration. The grip is Marucci’s signature grip that can be found on all of their metal bats. It’s made of a very soft material and provides traction with a bunch of tiny indented holes throughout the grip. The grip material is tacky and doesn’t allow your hands to slip. There is a good taper into the knob. The Posey28 is balanced and has a remarkably light swing weight for such a large-barreled bat. It’s a one-piece alloy, so it will never be as light as a composite bat, but Marucci did a fantastic job of cutting weight while maintaining durability. The barrel on this bat is the longest that we measured for a one-piece alloy. Marucci claims to have doubled the sweet spot on this bat when compared to the CAT6. It’s tough for us to get an accurate measurement of the sweet spot, but we can tell you that the barrel stays at its maximum 2 5/8 diameter for .81 inches longer than the CAT6. That is a 14% increase in barrel length. The long barrel tapers into the handle very gradually. This helps you keep some mass behind the ball even if you get jammed a bit. Marucci has proven time and time again that they can do a lot with a single piece of aluminum alloy. The Posey28 is a one piece bat, which tends to create a lot of vibration if you miss the barrel. 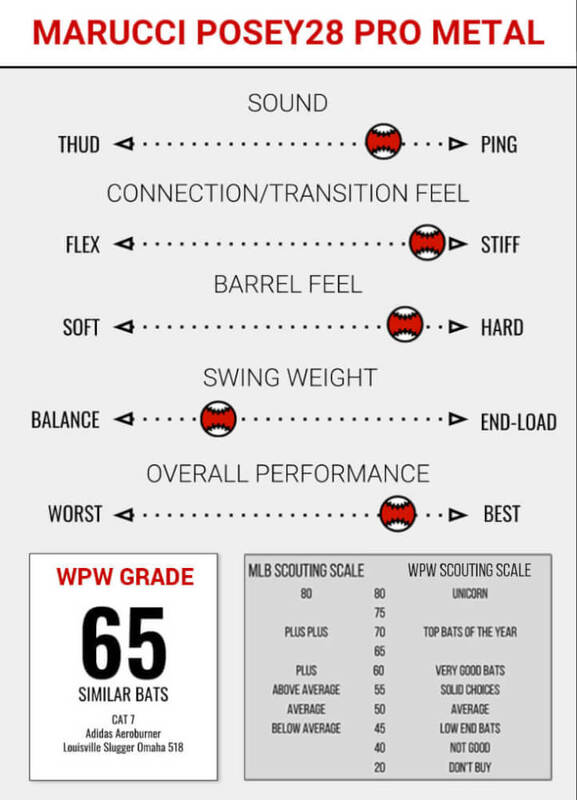 Many high-level players prefer this because they like the feedback the vibration provides and they want to know exactly where they made contact on the bat. The Posey28’s vibration dampening knob provides toned-down feedback on mishits. If you get one off the end, you’re still going to feel it but it is significantly less than some competitors’ one pieces. This knob makes a weird sound when tapped on the ground, so don’t be alarmed if it hits the ground and sounds broken. The bat is pretty stiff both during the swing and on contact. The barrel is ring-free, which gives the bat a huge sweet spot without any dead zones. On contact, the bat produces a loud ping. I found it very easy to barrel up balls with the long barrel and lighter swing weight, and I liked hitting with the gradual taper in barrel thickness. The Posey28 is simply a great bat that can compete with anyone in the one-piece alloy crowd. A purchase of the Posey28 will give you the same high performance of Marucci’s top metal performer, the CAT7, with the PRO look of wood. Get it at JustBats.com.